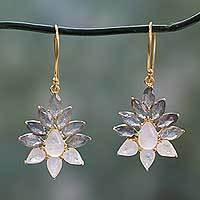 These are truly beautiful earrings! Well worth the wait. I will cherish them for a long time. Thank you Khun Boom for your beautiful work! Amazing how something so small can have such an impact! 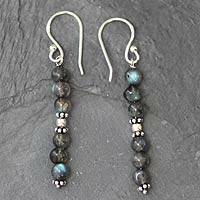 Although diminutive in size, the labradorite stones are luminescent and feel light on my ear. Thankful for this artisan. Her talent and passion are obvious. 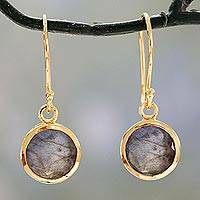 Labradorite and Agate Dangle Earrings from India, "Evening Glamour"
A trio of glamorous agate is displayed above an oval of natural labradorite in this pair of dangle earrings from India. 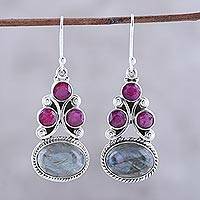 Presented by Neeru Goel, these earrings are handcrafted of sterling silver. 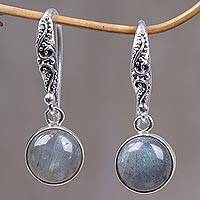 Sterling Silver Earrings Labradorite Handcrafted in Bali, "Purity of Moonlight"
Argent tendrils form graceful arabesques, bringing a touch of Bali to Wirabhuwana's beautiful design. 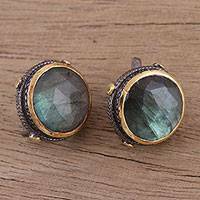 Crafted by hand, these sterling silver earrings feature the translucent glow of labradorite. 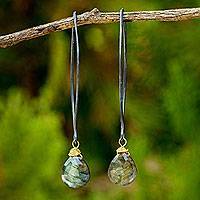 Labradorite and Sterling Silver Dangle Earrings from India, "Dancing Soul"